W Ladejinsky was a brilliant scholar of global land reforms and ceilings, and he also studied India extensively. Charan Singh followed his writings closely. 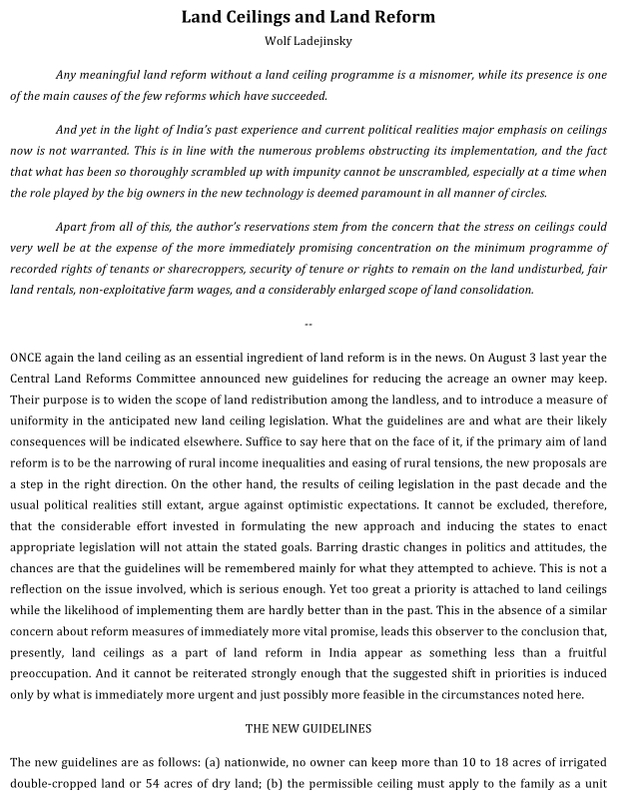 This is an excellent article from 1972 that is relevant even today, specially in its conclusions that land reforms and land ceiling (implemented either indifferently or seriously) cannot solve India’s problem of poverty. “The size of the cake is small, and the claimants too many”. One had to remove the ideological blinkers of building a ’socialist society’ as a reason for land re-distribution. In reality, if the removal of poverty is the prime responsibility of political leadership then a holistic view had to be taken and practical steps implemented. Charan Singh's position was that UP had a situation where the land to be obtained after implementation of land ceilings would not be sufficient to meet the needs of either the landless or those whose land holdings were uneconomic. His approach was holistic - a primary and sole focus in the immediate term on bringing (a) (some form of) prosperity to agriculture by instituting land reforms - as he defined them, to ensure landlordism is completely abolished, legally ensure the landlord does not have the ability to resume holdings from the former tenant; (b) implement a rigorous program of land consolidation for enhanced land efficiency and productivity (c) provide land ownership of the land on which the Dalits had their homes as a practical step to building security in their minds (d) invest scarce capital in agriculture (e.g. irrigation, better seeds, fertilisers specially organic, farming cooperatives, and finally (e) develop alternate courses of rural non-farm employment through small scale/micro manufacturing. On the last point, building rural non-farm employment as it is called today, it is indeed ironic that Manufacturing in rural areas has dropped from being 32% of such rural non-farm employment in 1994 to 17% in 2015 today. Fundamentally this is the destruction of traditional craftsmanship and village IPR, and the addition of the former raisins from Kumhars to Julahas to the ranks of the landless unemployed. The political leadership, of all political parties, gives lip service to the village but invests nothing where it is urgently required - in rural, non-farm employment. Make in India makes little sense without this.